No visit to San Diego is complete without a stop at SeaWorld® San Diego. This fabulous aquatic adventure theme park offers fun and excitement for the whole family. There are thrilling amusement park rides, amazing animal interactions, and lots of opportunities to learn about all the beautiful, exotic creatures that live there. If you want to visit SeaWorld® San Diego, why pay full price when you can get SeaWorld® San Diego discount tickets through aRes Travel? SeaWorld® San Diego is perhaps best known for its world-renowned orca shows. 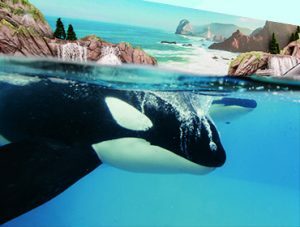 Did you know you can also get up close and personal with the orcas in the underwater viewing area? Orcas, also known as killer whales, are ocean predators with big teeth that they use for eating prey such as seals. Learn other amazing facts about orcas during your visit! Dolphin Point is the viewing station for SeaWorld® San Diego’s pod of bottlenose dolphins. When the dolphins aren’t acting in a live show, you can view them from just inches away at Dolphin Point. Bottlenose dolphins are perhaps the most recognizable dolphin species, often seen in movies and TV shows. SeaWorld® San Diego is a great place to learn more about them. Most of us will never be lucky enough to visit the Arctic Ocean, but you can view arctic habitats of both walruses and beluga whales at SeaWorld® San Diego. Walruses and belugas are both sea mammals with thick layers of fatty blubber to keep them warm in the frigid Arctic sea. Learn more fun facts about these cool creatures at the Wild Arctic exhibit. Sea lions are arguably the most famous performers at SeaWorld® San Diego, and you’ll know when you’re getting near Sea Lion Point when you can hear their distinctive bark. There are several differences between seals and sea lions. Only sea lions can stand on their front flippers and bark loudly like a dog. Visit Sea Lion Point to learn more about these eccentric and lovable characters. Visit SeaWorld® San Diego for Less with aRes Travel! 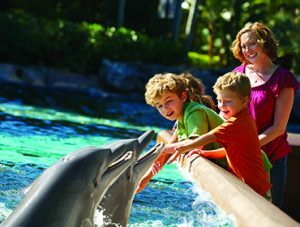 For cheap SeaWorld® San Diego discount tickets, the best savings on hotels, and exclusive deals on travel, call 1 (800) 434-7894 (international callers use +1 (619) 546-5622) to speak with an aRes Travel planning expert seven days a week, or book online now.